The holidays are coming but there’s a limit to how many sweet and rich ingredients a person can or should imbibe. That’s especially true if, like me, you’re thinking about appropriate holiday cocktails while dealing with a bit of a lifelong weight issue — these posts haven’t exactly helped! — and also trying to prepare for upcoming celebratory indulgences. So, while you’re definitely free to make the more traditional holiday cocktails I’ve offered in the past, this week, I took a complete break from the flipping excess of last week’s beverage and went with something simple, and only a little bit sweet. The Horsecar is a drink of uncertain origin as far as I can tell, but Saveur tells us it was featured in a 1956 cocktail book issued by our men’s magazine forebears over at Esquire. It’s a definite relative of the various Perfect Manhattan-esque drinks I’ve been messing with lately, combining both sweet and dry vermouths. And, yes, it’s a near replica of the Jumbo — which, by absolute sheer coincidence, was the featured drink here just barely under two years ago by about three days. Still there’s one key difference. See if you can spot it. Not a lot of surprises here. Pour the rye, vermouths, and bitters into a cocktail shaker and mixing glass. Shake or stir, and then strain into a chilled cocktail glass. Contemplate the millions of subtle variations possible when you combine liquids in differing proportions. My rye brands this time around were Rittenhouse, Old Overholt, Bulleit, and Alberta Dark Rye. My dry vermouths were Dolin’s and Martinis. My sweet vermouths were Martini, Vya, Carpano Antica, and, experimenting with a new brand, Cocchi Vermouth di Torino. The results were uniformly very nice, with floral and sweet qualities predominating. Probably the single most drinkable version contained Old Overholt — not really a personal favorite — Dolins and Carpano Antica. That version would have been the height of craft cocktail bar orthodoxy, except I shook it instead of stirring. Yes, it was clouded with ice crystals but it was also very easy on the palette without being boring. I liked the Horsecar stirred as well. Those drinks were definitely a bit bolder in flavor, and could also be quite lovely. The only one that didn’t seem to work as well contained Alberta Dark Rye; it’s a brand I like quite a bit, but it’s a bit of a whiskey outlier and actually contains 1 percent sherry wine. Sometimes the dark horse really does come in last. Let’s get this out of the way: the Perfect Cocktail is not the perfect cocktail, but you already knew that. It is, however, not one bit bad. My guess would be that this little known selection from Harry Craddock’s 1930 “The Savoy Cocktail Book,” such as it is, is either named after the Perfect Manhattan or I suppose it could be a precursor. What they both have in common is a combination of sweet and dry vermouth combined with a spirit…though the proportion of hard liquor is less than it would be if were something closer to a sweet or dry martini. It’s a fairly tasty concoction if you use the right ingredients and it’s not too terribly strong, which is sometimes a very good thing. Also, the simple symmetry of its ingredients is, if not actually perfect, pretty snazzy. Combine the liquids in a cocktail shaker with plenty of ice. Shake well and strain into a chilled cocktail glass. If you insist, it is also okay to stir this in a shaker or mixing glass and then strain the slightly prettier, but less icy, liquid into that same chilled glass. In preparation for the Perfect Cocktail, I made sure I was well stocked with various types of vermouths — all purchased in small bottles to maximize freshness. (Yes, I’m going to remind you, yet again, to always refrigerate your opened vermouth bottles and to try and use them up within a month or two, if possible.) Since the vermouths actually predominate in this drink, they’re obviously the most important ingredients. I used Martini and Dolin for my dry vermouths; Martini, Vya, and Carpano Antica were my sweet choices. Overall, the more expensive options seemed to work notably better, with the possible exception of Vya. Martini Extra Dry seemed to pose a special issue, as the Perfect Cocktail seemed to accentuate some of its more imperfect bitter flavors. My gins this time around were Bombay Dry, Gordon’s, and Plymouth. A slight edge went to the latter. 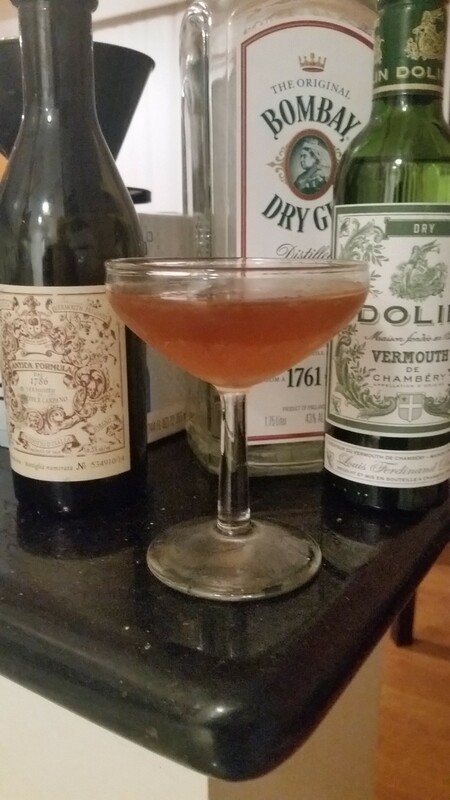 Using Dolin, Plymouth (slightly less dry than you standard dry gin), and Carpano seemed to yield the best result, with the most piquant combination of sweet, floral and more mouth-friendly bitter flavors. Though I usually suggest stirring gin-centric beverages, I liked this a lot better shaken. That’s probably because it’s really the vermouths that are the star of the show, with the sweet vermouth being the most dominant. It might be worth trying this drink even if you’re out of gin but have some vodka on hand. I also experimented with using a cocktail cherry. I can’t say it helped noticeably, but neither did it hurt. So, if you’re looking for an excuse to use a cocktail cherry — and some of them are better than you might think — you might as well use it for the Perfect Cocktail. Gin gets plenty of respect among cocktail aficionados — certainly more than vodka — but it’s still mainly thought of as a something best enjoyed in some kind of mixed drink, whether it’s as unvarnished as a very dry martini, a bit more gussied up as an Aviation, or in a gin and tonic, the arguable king of highballs. Unlike whiskey, brandy, tequila, and even poor, maligned vodka, almost no one drinks gin by the shot or the snifter and while premium gins abound, super-premium gins are rare birds indeed. Still, with a price point of about $50.00 for a 750 ml bottle, Nolet’s Dry Gin is staking out a claim at the upper end of the mass gin market with a product that justifies its higher price with a flavor profile you won’t find anywhere else. I know this because I got a free bottle in the mail and I’ve been having a great deal of fun trying out this product in a number of classic drinks. Nolet’s has a fruity, spicy flavor that is noticeably light on juniper — the botanical that pretty much defines the taste and aroma of gin in the minds of most drinkers, whether they know it or not. I’ve grown to like it in gin, but juniper has always been a fairly tough sell with me. (I still greatly prefer Irish or English Breakfast tea to juniper-heavy Earl Grey.) So, I think Nolet’s is a dandy change of pace, high price point notwithstanding. I’ve found it makes a fascinating martini (use a lemon twist) and a really terrific G&T (3 parts tonic to one part gin). Finally, they have a very nice variation on one of my very favorite gin cocktail classics created by New York bartender John McCarthy, even if I couldn’t resist tweaking it slightly. Mr. McCarthy’s original recipe calls for simply building this drink in a rocks glass with ice and an orange slice garnish. With plenty of stirring, this is a decent drink, though on the heavy side for my taste. On the other hand, I found myself liking this drink immensely simply by making one of two small adjustments. First, you can serve it up — i.e., shaken with ice and strained into a cocktail glass — as I suggested was best with the original Negroni cocktail some time ago. You can also go crazy and simply follow McCarthy’s original recipe augmented with an additional bit of soda water for a boozier Negroni/Americano hybrid. You might want to use a double rocks glass to prevent overflow. 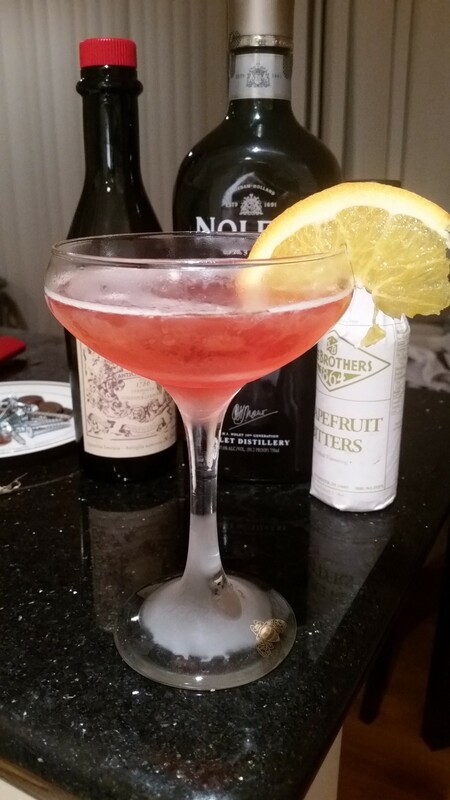 The main difference between Nolet’s Negroni and the original is the inclusion of grapefruit bitters. Usually, the inclusion of Campari in any drink is considered bitters enough. Moreover, McCarthy’s original recipe specifies Carpano Antica sweet vermouth, which has a chocolatey, bitter undercurrent. Nevertheless, I think adding the bitters works just fine in a beveridge that can still come off a bit syrupy. At the same time, I found I actually rather enjoyed my modified versions of this drink even more when I substituted Noilly Pratt sweet vermouth with its simpler, sweeter flavor that actually needs those grapefruit bitters to keep things grown-up. It’s entirely possible Martini or Cinzano would work well, too. Go with your mood, I say. I sing now, for the umpteenth time, of the raw egg white, feared by many, adored by classic cocktail aficionados, and a sure way to get me to sit up and pay attention to almost any cocktail. What could a drink do to be both worthy of inclusion, yet apparently unworthy of sufficient verbiage — or even a reasonably accurate graphic? Was both Wondrich and the Esquire art department tired and on deadline? Was he forced to grudgingly submit to pressure to include this drink from the vast and shadowy gin-sweet vermouth-and-egg-white-industrial-complex? Finally, why was every other cocktail I could find on line called “White Elephant” a completely different concoction that usually involved ingredients like coconut milk, white creme de cacao, heavy cream, white rum, and other things that are very, very white and nothing but white? This drink, as my brilliant photographic work reveals, is not precisely white, as elephants go. What gives? Who knows, but clearly the first thing to do is try the damn drink. The drill is basically the same as for every cocktail involving egg whites or eggs. Combine the gin, vermouth, and egg white in a cocktail shaker, but with no ice. Shake well to emulsify the egg, then add ice and really shake well. Strain into a chilled cocktail glass or reasonable facsimile. Add a cherry for a bit of extra sweetness and color, and toast the pachyderm of your choice. I have to say that while I thoroughly enjoy this drink and find it nicely refreshing yet neither too sweet nor too anything else, I can see what it maybe hasn’t taken off and has become, yes, a white elephant of a mixed drink. It’s not really sweet enough for the sweets lovers, nor is it boozy, complex, bitter, or tart enough for many a cocktail snob. 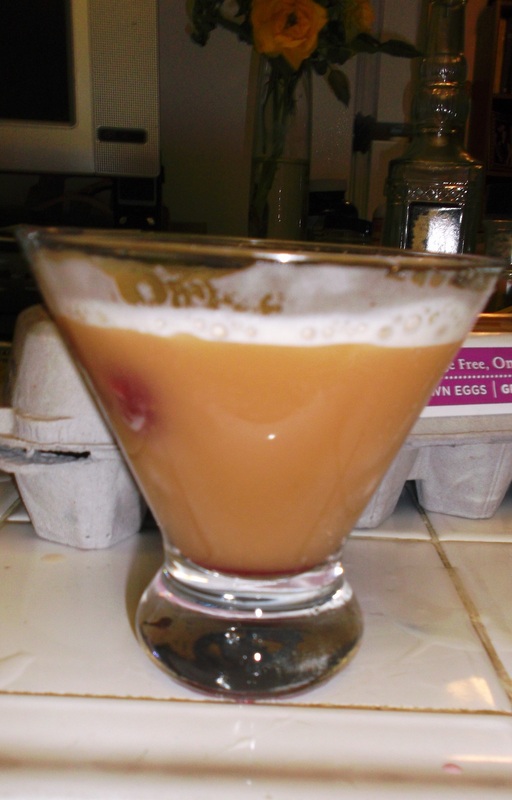 It’s nevertheless got plenty of booze in it, and the combination of egg white, liquid, and ice guarantees it all goes down in the most delightful way. A wet martini not only with a head, but with a wonderfully comfy ova cushion. I did try messing around a bit with ingredients and proportions. Lowering the amount of gin by half an ounce didn’t really hurt the drink, but the increase in sweetness turned out to be minimal. The results using both of my two fall back sweet vermouths, Noilly-Pratt and Carpano Antica, were just fine, though this time I leaned ever so slightly towards the lighter touch of Noilly-Pratt. Still, the only really wrong move I made was adding bitters. So often, bitters can really save a drink; sometimes, however, it’s just the reverse. So, why is the White Elephant so benighted that even a chatty cocktail historian has almost nothing to say about it? I think it’s the name. Not only is it unflattering, it’s inaccurate. This elephant is not white. It’s another color entirely.